Summary and Definition: The Miwok tribe were a California tribe of Native American Indians who were hunter-gathers and fishers. They lived in north-central California, from the Pacific coast to the west slope of the Sierra Nevada Mountains. The Miwok tribe are highly distinctive due to the tattoos and paint they used to adorn their bodies. What language did the Miwok tribe speak? The Miwok tribe spoke in seven different dialects of the Penutian language and were comprised of three groups. The Coast Miwok, the Lake Miwok and the Sierra Miwok. What was the lifestyle and culture of the Miwok tribe? The lifestyle of the Miwok tribe varied according to the natural resources of their location. The name Miwok derives from their word 'Miwuk' meaning person. They were neighbors to the Wappo and Washoe tribes, with whom they frequently traded. Their tribal lands were subject to various incursions by the Spanish, Mexicans and finally the Americans. The people watched as their tribal lands fell to the Spanish who wanted to convert the tribe to Christianity and enslave them, the Mexicans who forced the people to work on their farms and the Americans who moved west along the California Trail who were joined by the Gold Rush settlers. The Miwok people were decimated by the diseases brought by the invaders and subjected to atrocities. Following the short-lived Mariposa Indian War (1850) those who survived were forced on to various reservations. Where did the Miwok tribe live? The Miwok are people of the California Native American cultural group. The location of their tribal homelands were in north-central California. The geography of the region in which they lived dictated the lifestyle and culture of the Miwok tribe. What did the Miwok tribe live in? Wikiups: Bark Wikiups, lean-tos or cedar bark shelters: During the summer the semi-nomadic California Miwok tribe lived in temporary pointed, conical cedar bark shelters, constructed using several poles tied together that were covered with bark, sticks over the framework. The interior Miwok also lived in temporary lean-tos, or pointed cedar bark shelters, made of bark over sapling framework. Winter Pit Houses / Earth Lodges: The more permanent winter homes of the Miwok consisted of villages of semi-subterranean winter homes that were set about three feet into the ground. The pit house was constructed of dirt sidewalls, and a pitched roof. The winter houses had a central fire pit. An opening in the roof allowed the smoke to escape and also let light and air in. What food did the Miwok tribe eat? The food that the Miwok tribe ate varied according to the natural resources that were available to them. Their food included staple diet of acorns which they ground into acorn meal that were stored for up to one year, ground into acorn meal and leached to make soup, cakes and bread. The Miwok hunted deer (venison), black bear, elk, fowl, and small game such as jack-rabbits and quail. Fish was also another important Miwok food source, particularly salmon, but also included trout and shellfish. The Miwok hunter-gathers collected other foods including buckeye nuts, mushrooms, various greens, roots, bulbs, and berries. Most foods were dried and stored for use during the winter months. Coastal groups of Miwok hunted for sea mammals and considered dried seaweed a delicacy. What weapons did the Miwok use? The weapons used by the Miwok included spears, slings, knives, bows and arrows and clubs. What transportation did the Miwok use? The Eastern Miwok used a tule balsa on navigable rivers, the canoe style of boat was unheard of. Log rafts were used on the coast. What clothes did the Miwok men wear? The clothes worn by the Miwok men were limited to loin cloths woven from grass or bark fibers. In the winter months warm clothing was needed that were made from the hides of animals such as deer (buckskin), elk, squirrel, rabbit and wildcats. 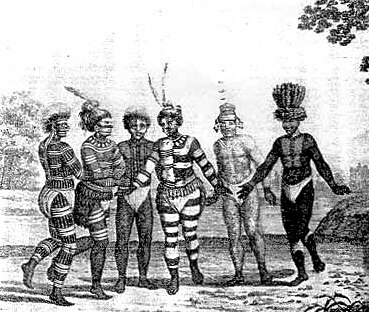 The Miwok winter clothing and garments included fur robes, kilts or aprons, and leggings. They wore one-piece moccasins with long tops that were wrapped about the calf, but went barefoot in the warmer weather. What clothes did the Miwok women wear? The type of clothes worn by the Miwok women included front and back aprons made of shredded willow bark. Their dress fell to calf length and were belted. Special clothes were strung with ornaments, tassels, shells and quills. Twined tule sandals or moccasins covered their feet and in the winter they wore fur robes to keep out the cold. The ceremonial crown-style headdresses of the Miwok, as seen in the above picture, consisted of a flicker quill headband that covered the forehead and was tied at the back. The Flicker headbands were made from flicker the longest and narrowest wing feathers. These dark pink or yellow feathers were placed side by side and sewn together to form a long headband. These were bordered by dark brown feathers and attached to the head with string. Feather hair plumes were added as a separate form of decoration to complete the Miwok headdress. Most Miwok people also wore ear and nose ornaments as well as face and body paint, that was similar to the Mojave tribe. They also practiced tattooing. Their striking face and body paint made use of black and white coloring often applied in horizontal lines, as can be seen by the above picture. The white paint color was obtained from chalk deposits and charcoal was easy to make resulting in distinctive white and black face and body painting. Miwok History Timeline: What happened to the Miwok tribe? The following history timeline details facts, dates and famous landmarks of the Miwok people. The Miwok timeline explains what happened to the people of their tribe.